The fourth Color TV-Game system was based on one of Nintendo's first arcade games Block Fever, based on the Atari game, BreakOut. Using the dial on the system, control the paddle on screen to bounce a ball around to break all of the blocks. There are six variations to play. Block Breaker was more successful than Racing 112, with around 400,000 units sold. The system was also used in a number of stores for high score competitions. Shigeru Miyamoto once again designed the hardware for the system. 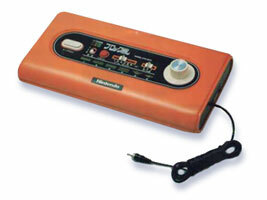 As with the other Color TV Game systems, you can use the switches to play a number of variations, each with its own rules. The basic game. Break all of the blocks on the screen. Each band of coloured blocks scores a different number of points. The same as Block Out, only the fourth row of blocks down has been removed. The same as Block Out, only a row of blocks appears below the paddle, helping you if you drop the ball. You don't have to break these save blocks to beat the stage. The rows are spaced out, and the ball doesn't stop when it hits a block. The aim is to clear the blocks in the fastest time. The aim is to clear the four flashing blocks at the top of the screen, breaking as few of the other blocks as you can for a higher score. The same as Block Lighter, only the four blinking blocks are in the center of a large block formation. Break as few non-flashing blocks as you can for a high score.